I made one special request in this box: I wanted a pair of pants that weren’t dark blue denim, since that’s really all I own. Seriously. I have six pairs of jeans, and two are skinnies, but they are all dark-blue denim. I figured it was time to diversify a little bit. 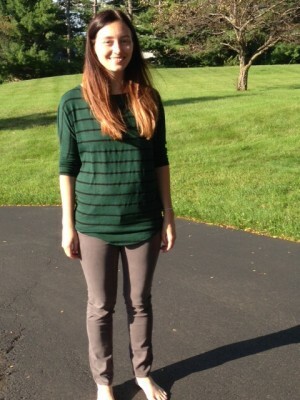 My stylist completely delivered by sending me an amazing pair of grey skinnies. In fact, she nailed my style again with this box, and I loved every single thing in it. There were some small problems, but I’ll talk about those below. So without further ado, here’s what I received for my special birthday Stitch Fix. This was the piece I didn’t expect to like. A lot of the photos I saw of it online really looked strange to me with the details on the front, but then again, a lot of the photos I saw online had the shirt in a blue, and I didn’t like the gold detail with the blue. I put this on, though, and liked it almost instantly. The shirt is lightweight and super comfortable, and I thought the sleeves were really cute. It’s a bit hard to see the neckline here (sort of a V slit), since I really should have pulled my hair back, but you get the general gist, hopefully. I knew I wanted to keep this one even before I tried it on. I love stripes, and the shirt was so incredibly soft. Basically for me to keep this one it had to not look like a bag on me, and surprise surprise, it didn’t. I love this shirt so much. I might wear it tomorrow. (Also, I really should have pulled my hair back for these pictures, but I figure it’s okay, since my favorite hairstyle is down like this, so it’s at least a very realistic look. When I first saw this was in my box, I was excited. I don’t own anything like this, but I’ve sort of been on the lookout for a while now. Then I saw the price tag and just about fainted. 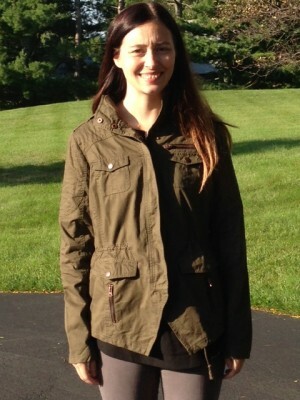 I thought no way, I’d never spend that much money for a fall jacket. I need to stop trying to make up my mind before trying things on, though, since yet again I changed my mind after trying it on. It’s the perfect balance of lightweight without being too lightweight. It actually would have been perfect for a day like today, and I like that you can wear it indoors and not look strange. 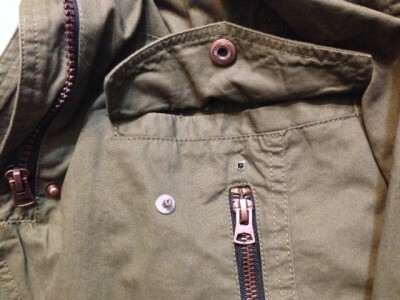 I love the detail on this jacket, and it fit perfectly. I love that you can cinch the waist a bit to give it a different silhouette. I loved everything about it…but then I put my hand in the front pocket, and pulled out a piece of one of the snaps, which had apparently broken off at some point. If you look closely here you can see that the bottom side of the snap is missing from the jacket (I set it off to the side a little bit, but even with that piece, there’s still a little piece that’s missing). I was so sad, and I almost said screw it and kept the jacket anyway, since with the flap on the pocket down, you can’t even tell anything’s missing, but for the price, I just can’t justify accepting a piece of clothing that isn’t perfect. 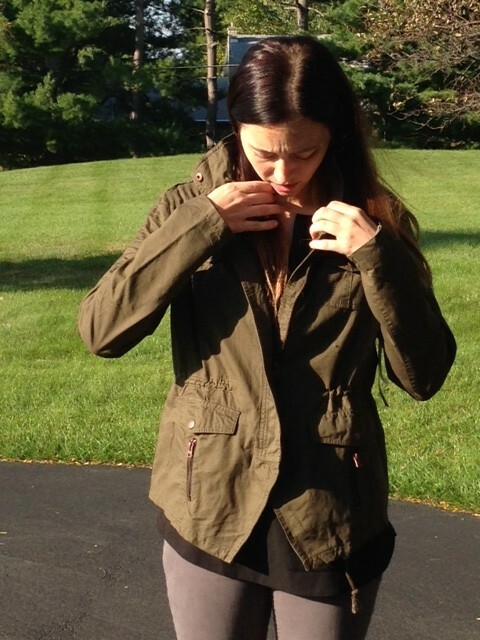 I emailed Stitch Fix asking if it’s possible to get a replacement jacket, because I would totally buy this jacket if everything was perfect. This necklace is so unlike anything I’d ever pick out for myself. I’ve never been someone who wears a lot of jewelry, but I’ve been trying to change that a bit in the past few years. (I’ve already come a long way, just three or four years ago you almost never saw me in anything but old jeans and a sweatshirt.) I like this necklace, which didn’t work super well with either of the shirts in my box, but I’m not sure I love it. I’ll have to try it on with more of my clothes, and I’ll have to wait and see what the Stitch Fix team says about my jacket, and how that affects checking out. If I can get a new jacket I’ll probably keep this, but if not, I’ll send it back. This skinny jeans, which I’m wearing in all of the above pictures (save for the one of the necklace obviously), were my absolute favorite piece in this fix. They fit perfectly, a feat in and of itself when it comes to skinnies, since I still kind of have soccer-player legs and often find that skinny jeans are made for girls with sticks for legs. They were also the perfect length, and oh my gosh, they were so incredibly soft. I meant to try on both the shirts with a pair of regular jeans, but I didn’t want to take them off. And they looked so cute with both of the shirts, and I can already think of a few pieces in my closet they’ll go well with. They worked with a pair of brown boots I tried on (not pictured), and I think they’d look excellent with a pair of black pumps—another thing I’ve been on the lookout for lately. So all in all, this was another excellent box. With unlimited funds I wouldn’t hesitate to keep everything (well, with unlimited funds and a not-broken snap). My stylist, Shelia, has done such a fabulous job both understanding how to match my current style and how to help me push it in the direction I want it to go. I’ll need to take a few months off of boxes now because of finances, but I’ll definitely be getting a third box at some point! Final note: If you’d like to join Stitch Fix and would like to give me a $25 referral bonus, please feel free to use my personal link to sign up. I’d recommend the service even if you don’t want to use my link, but figured I’d share in case anyone did!